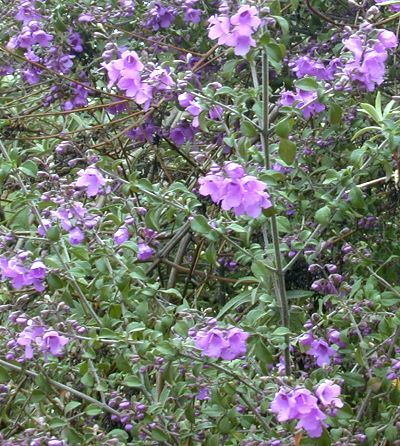 Stunning purple bell shaped flowers absolutely cover this fragrant Australian native. 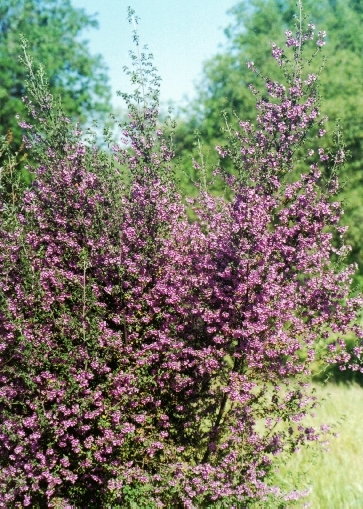 Rising to eight feet or more, this hardwood shrub with its tiny dark green leaves is a necessity for perennial gardens in mild winter areas where the temperature doesn't go below 20 degrees. We had one reach 8 feet tall and last five years here in zone 8. Then one year it just died. We could never attribute its death to any particular reason. In colder areas, they can be grown in containers and enjoyed either as an annual or brought into a well lit room for the winter. Supplemental lighting is always a good idea when trying to over winter high light level plants. to be notified when this item is back in stock.